family by her side on January 17, 2019, after a short illness. She was a devoted Mother, Grandmother, Wife, Sister, Companion and Friend. Georgia was preceded in death by her beloved Grandson Tim "TJ Everson, Jr, husband Warren Everson of Friday Harbor Washington, husband Brad VanNoate of Lodi, fiance Peter Karpa of Murphys and parents Jim and Dot Clark of Ashland, Oregon. graduate from San Jose State College in 1956 with plans to become a teacher. While attending San Jose State, she was President of Alpha Phi Sorority and active in many social activities as evident by her very thorough scrapbooks. She also met future husband Warren Everson and many wonderful lifelong friends at SJ State. After college she married Warren and settled in Sunnyvale where they had three sons. HEr college friends as well as friends from her youth in Klamath Falls were central to her life until her final days. 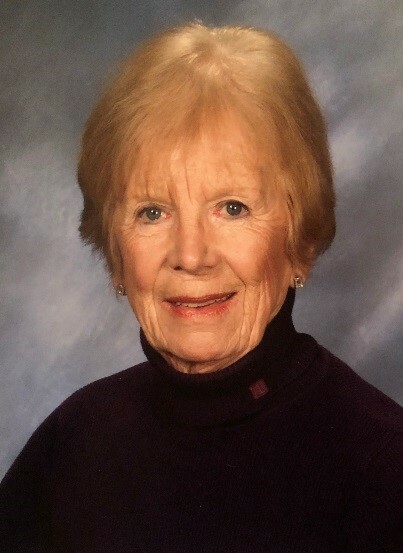 She would teach for many years in Campbell, Palo Alto and finally in Calaveras County, where she and the boys moved with second husband Brad VanNoate in 1970. She continued her education and received her master's degree in Education from the University of San Francisco in 1985 and finished her career as Vice Principle and Testing Coordinator for Vallecito Unified School District. After retirement she relocated to Roseville and traveled the globe with longtime friend Lane Weiss, formed many local Bridge groups and joined P.E.O. where she developed another group of close friends. Her homes in Murphys and Roseville were always the center of family holidays and celebrations. Georgia is survived by son Chris Everson of Orangevale, son Tim Everson (Dawn) of Manteca, so Andy Everson, (Lori) of Folsom and grandson Michael Everson (Michelle) of Eugene, Oregon, sisters Sue Richards of Medford, Oregon and Judi Berry (Hal) of Medford, Oregon. Graveside services will be held at noon on February 2, 2019 at Buena Vista Cemetery in Murphys. A Celebration of Life will be held following the services at the Murphys Hotel from 2 to 4 PM.